Ask around—right now, someone you know has a nightmare story involving movers. Maybe that’s you. If you’re jaded from a terrible experience with a shady moving company, then you never want it to happen again. Don’t worry, with an effective plan for getting an estimate on your move, you’ll ensure you pick the right moving company to get your property from point A to point B—and you will know exactly what you’re in for. Let’s look at four steps to acquiring an accurate moving quote: determine how much you are moving, read moving company reviews, find out what is included in their estimates, and getting those estimates in writing. Two key variables define a moving estimate. The first is the amount of stuff that’s getting moved. The second is how far you want it moved. With those two key factors filled in, your moving company should give you a guaranteed estimate if you follow the steps outlined below. To determine how much stuff you have, sometimes it’s wise to quickly go through the steps below, then get a mover to come out and tell you how much stuff you have. Those estimates will vary slightly from mover to mover, but at least you’ll have a ballpark to work with as you get quotes. Do your homework on local companies. Look them up on this site, then perhaps aggregate those reviews with those on other websites. What is the online reputation of the company? Do you have any friends that recommend or discourage you from using certain companies? If you can strike off any companies at this stage, then you have made it that much easier to determine which moving company you are going to use. At this point, you are ready to start making phone calls. Be clear and concise in what you want from your move. 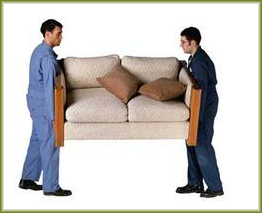 Do you want the mover to pack up your things, or are you doing that yourself? Are you moving a vehicle cross country, and do you want your mover to take care of it? As you talk to movers on the phone and then make appointments for in-home estimates, judge the “rapport” factor as well. There’s an unspoken quality you’re looking for in a mover as well. You should like them. It’s a good indicator that you will work well together. Some movers will give out legally binding estimates. That means that once that mover hands you that estimate on paper, that estimate is set in stone—no hidden fees, no up-charging. This is what you want. A legally binding estimate guarantees the price. Isn’t that what every customer wants? As you start getting estimates for your move, remember to determine the size of the move, read reviews of movers, find out exactly what your mover will guarantee, and then get that guarantee in writing. It’s the best way to ensure a headache-free move.